White Paper Abstract: Participation in accountable care initiatives has more than doubled in the last 12 months, according to 200 healthcare companies who completed the second annual Healthcare Intelligence Network survey on Accountable Care Organizations (ACOs). 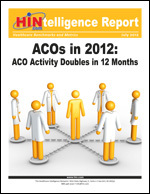 The typical ACO is smaller, too, as the number of active ACOs with 100 to 500 physicians dropped almost 50 percent in the last 12 months. This year’s survey provided new data on other healthcare professionals in the ACO, ACO reimbursement models, and ACO impact. Respondents said care coordination has improved as a result of ACO activity, and hospital readmissions for patients in ACOs has declined.